I had always thought how waterlilies are propagated in the wild. There are tons of wild water lilies in our province Punjab specially the white water lily. They are all tropical i guess. Finally i captured a bee doing this little work. I think she is trying to pollinate. Well, even if she is not, after all the hard work capturing these shots, believe me she is doing nothing but trying to steal the pollen. 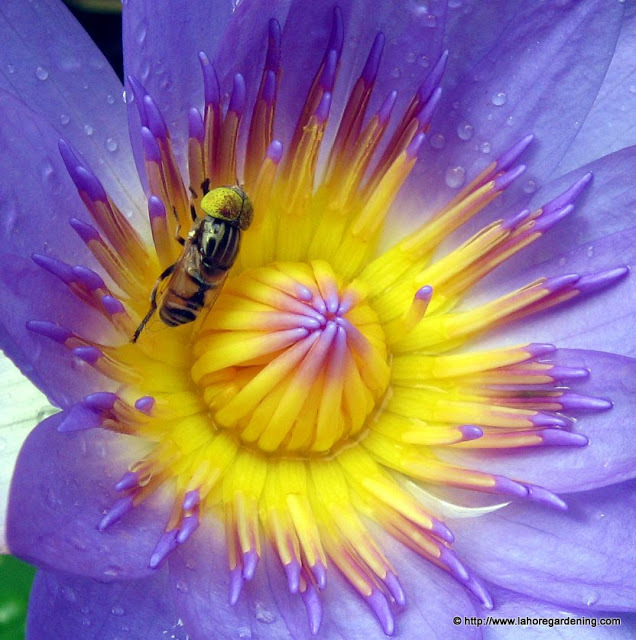 I wish someday i will see a butterfly on these waterlily blooms if butterflies do that. 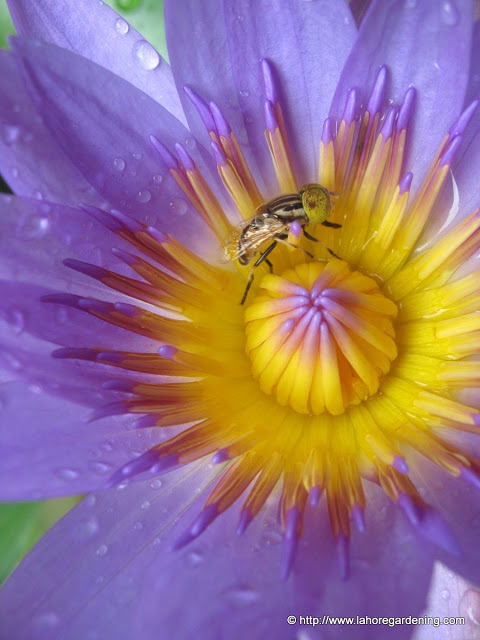 So here goes my picture of Bee pollinating waterlily. Update: As indicated by “Dont bug me”, it is a hoverfly and not a bee. Then she picked it and there she go. This is blue tropical water lily i am growing on my terrace. It survived last winter without protection but got very weak. I am going to protect this waterlily with bubble polythene this winter for first time and see how good it is. The bee is an added bonus to the lovely center of the flower. Great shot of the bee on the lily. Love that purple! Thanks for visiting The Whimsical Gardener. I’m so glad you did as it led me to your beautiful blog! 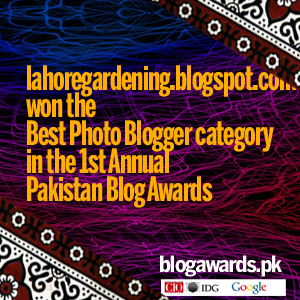 I love your title and the vivid colors of your photos. I look forward to reading in the future! That is one awesome flower and bee and two great shots! Love the way you have gone straight to the heart of the problem! Great shots of a splendid waterlily. The colour of the flower is gorgeous, but it is a hoverfly, not a bee. What great color on the petals, and to capture a bee at work is a plus to the photo. I love the colour of the waterlily! Makes me almost want to live in a tropical place so I could grow them! What a lovely shade of blue. Great shots. Have a wonderful week. The spectacular colors make this image! Beautiful capture and beautiful colors! Good luck with it over the winter. A gorgeous colour to your waterlily. Gorgeous flower and its eye-catching color combination! Wonderful photos! Beautiful colors — thanks for posting! And thanks for your visit and comment to Fold, Fallow and Plough! Wow, beautiful photos. Thanks for the visit on my wall at Blotanical. Great and interesting blog, I will definitely keep in touch! lovely blog. Will bookmark and be a regular visitor. Great shots of the hoverfly!